The foam wizards expertise ! Introduction to mattress foam technology choosing the correct foam mattress for a specific application. 55 Years of selling foam mattresses. The Foam Wizard shares his experience of sleeping on all the diffrent foam types. 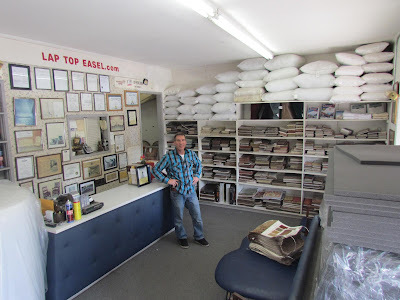 Back in the day hanging out at the family upholstery store with my father a master upholster was really cool. There was no daycare so parents would bring their children to work with them. I would entertain myself by creating figures out of Styrofoam with a wood file. The best was placing coil springs on the bottom of my shoes and bouncing around the back parking lot. It was also a chance to earn some pocket change sweeping the place then graduating to stipping old fabric off the furniture. Now that you know a little bit more about me I want to share with you what it was like sleeping on all the foam types we have had to offer over the past half-century. As a foam mattress this is the one that you would give to a guest so that they don't stay too long. Available in medium firm, this foam type will begin to break down in a short period of time being the least expensive and lowest in quality. What happens here is that the Polyurethane foam flatens out leaving sinking areas that do not return back to there original hight. The foam mattress will also lose its firmness becoming softer in a short amount of time. Polyurethane foam is the original foam type that the subsequent foam types introduced to the market over the years were based on. Polyurethane foam being a very lightweight foam is best used in packaging and shipping. A Polyurethane foam mattress can be used as a temporary mattress if you don't need it to last long. A medium quality foam mattress that comes in all the different firmnesses from vert soft to extra firm. I have to mention this because the miss conception I see here is that people think the name High Density means the foam is firm. The name was created to differentiate it from the original low quality polyurethane foam. The High-Density foam is not a sink without return foam like the Polyurethane. This foam type rather gets softer as it gets older and the softness creates a Hamic effect. Where the edges remain firm and the area used becomes softer over a few years time. A High Density foam mattress is a pretty good mattress at a medium quality. This is a good foam mattress that is available in a firm and will provide comfort for quite some time before it softens all over. This foam mattress is good for the long hall and will provide comfort on the firmer side for several years. If you want to start out with a firmer foam mattress and have it sofen to a comfort leve you like after a couple of years this would be the foam mattress you will want. The Evlon foam mattress has a nice supporting feel and is a good quality mattress. The High Resilience foam mattress is fast to return to shape when pressure is applied and released. Where the lower quality foam types are slower to return and feel less pliable, making the High Resilience foam mattress a very good mattress for any application. I also like that the foam mattress is available in any firmness from very soft to extra firm and that last a long time. They do get softer all over as they get older and if you rotate the foam mattress you can get a long life out of it. The High Resilience foam mattress will take a beating and return to its original foam. That's why it has the name High Resience and it is a very good foam mattress. Only a Memory foam mattress has elastic add to create that squshy feel that lessons the transfer of motion. One of the later foam types to come from the Polyuthane family Memory foam is ment to provide comfort through it's conforming characteristics. As such you don't want it too thick or it will hold you like a glove making you feel uncomfortable and unable to roll over. Having a smaller cell structure, the Memory foam mattress tends to heat up. It is also heavy and cumbersome if you're trying to move it or get a cover on it. The benefits outweigh the nuisance making the Memory foam mattress a very good mattress. Made from rubber, a Latex foam mattress is very heavy and hard to maneuvee when you're trying to get it in place. Latex mattresses go back to a time when it was one of the two foam mattress types my father had to offer on the open market. The Latex foam mattress is the foam type I find to be the best not only for the length of time it last. But that it also comes in all the diffrent firmnesses from very soft to extra firm. Being a rubber based foam mattress and not a Polyurethane based foam. A Latex foam mattress will feel a little softer than other foam mattresses and have more of a bounce. The Latex mattress is an excellent quality foam mattress in how long it last and how comfortable it is. Vist us today and take a look at all the different types of foam mattresses we offer with free shipping. By David Pulver Aka The Foam Wizard. President at Upholstery Decor Inc. Egg crate foam is also known as convoluted foam. The cut design of egg crate foam is to create channeling for air flow. To create egg crate foam, a mattress four to eight inches thick is compressed between rollers and pushed through a convoluted saw blade. The foam is then configured into the egg crate design and the foam mattress is now two matching egg crate mattresses, resulting in a finished height of two to four inches thick. The classic cone shape provides high and low pressure points. The low pressure points insure that obstructions of the lymphatic and venous of the limbs are kept to a minimum. The high points of the cones are compressed with weight distribution in the shoulder and hip areas, while the waist and leg areas receive more support. This gives the egg crate mattress the ability to conform to the shape of your body. The channeling allows for the skin to breathe and is a preventive measure for bed sores. This is why egg crate mattresses are used in hospitals and mainly distributed through medical companies. An egg crate foam mattress is only as good as the quality of the foam it’s made of. Most large chain department stores sale the low quality standard polyurethane mattresses because of the low price point at retail. Their thought behind this is that an uneducated consumer is their best customer. Therefore we have translated our vast knowledge of foam mattress quality, comfort, and longevity into simple terms so you can easily understand and make the correct choice of foam mattress quality for your desired application. A satisfied customer is our main concern. You are the foundation of our success over the past half century as we continue to build our reputation as one of the most trusted companies on the web. The Foam Wizard Copyright 2012. Foam mattresses and foam mattress toppers are available in a wide range of foam qualities. Memory foam to Polyurethane foam just to buy a foam mattress may seem confusing. Not to mention the many different names associated with the same foam types. First, we judge the foam quality. Low weight foam, polyurethane foam, at 1.2 pounds per cubic foot is a cheap foam quality. Medium weight High Density foam at 1.8 pounds per cubic foot is medium quality foam and Evlon foam at 2.2 pounds per cubic foot is good foam. Lastly High Resilience foam at 3.0 pounds per cubic foot is excellent quality foam. These are all Urethane foam types where foam weight determines foam quality comfort and longevity. Urethane foam is where you buy foam when looking for a reasonable priced foam mattress or foam mattress pad. At the high end is Latex foam with a foam rubber base. This foam mattress is 5.6 pounds per cubic foot. Latex is the only foam mattress that is made from the extract of rubber that gives this mattress a natural bouncy feel. The Latex foam has superior ventilation from the perforations placed into the foam mattress during the foam manufacturing process. This makes the mattress more comfortable from the air flow which brings up a foam topic in the mattress main stream of today. Of all the foam mattresses of today, Memory foam is the foam it of them all. This foam type has mass media attention like no other foam. Memory foam comes in 3 to 6 pounds per cubic foot. The importance of knowing the foam weight is now apparent. A Memory foam mattress reacts to heat sensitivity, becoming softer foam in hot areas and a firm foam in cold areas. If the foam mattress is more than four inches thick, body motion transfer decreases as the Memory foam mattress thickness increases making it difficult to roll over. The Memory foam has been known to hamper relationships. The way to get the Memory foam quality and comfort in a mattress is to use the Memory foam as a foam topper, three to four inches thick. This is the answer to what is a mattress topper. A foam firmness made simple is called ILD, short for indent load deflection. The foam mattress has pressure applied and is given a rating of its foam ILD number. A foam mattress with a low number eighteen is soft foam. A foam mattress with an average number thirty six is a medium firm foam mattress and a foam mattress with a number seventy is an extra firm mattress. Memory foam mattress toppers conform to the shape of your body. The foam mattress topper is excellent in a three to four inch thickness. The High Resilience foam mattress is excellent in a four to five inch thickness for the maximum comfort level when looking for a high quality foam mattress at a reasonable price. The Latex foam mattress is the highest quality foam mattress. The Latex foam mattress is bouncy where the Memory foam mattress topper is a conforming foam topper. The Latex mattress has bounce and ventilation where the Memory foam topper is heat reactive foam with no bounce. This makes it apparent that the best foam mattress topper is Memory foam and the best foam mattress is High Resilience foam. Foam mattress users have said a soft Memory foam topper with a medium firm High Resilience foam mattress is the most perfect foam mattress in quality comfort and longevity. The Memory foam topper and the High Resilience foam mattress are a perfect foam match for their excellent foam qualities at a lower price in the high end of foam mattresses. Foam mattress quality and foam firmness are personal preferences for everybody. When the need to buy foam arises, we are where to buy foam with the lowest prices, largest selection and free shipping. FoamOnLine.com bold moves and big Ideas. For the past decade, foamonline.com has been moving to the top as the number one on line foam distribution center, operated by Upholstery Decor, Inc. a family owned company, in business for the past 50 years.Foamonline.com with its vast knowledge in foam technology created a new video on U Tube that makes it easy for anyone to choose the correct foam for their application .David Pulver, the foam wizard knows foam like no other, he is very knowlegeable. The video was informative and educational, as well as entertaining. Born into the Upholstery and foam business. Building my career to out size of my fathers.